While the highlight of any visit to the Schoodic Peninsula is to visit the various scenic points along the coastline, Schoodic Head is a little inland peak surrounded by lush forest that offers muted, but still enjoyable views of the surrounding area. Several hiking trails and an old dirt road head to the summit from several different starting points. A hike along the Alder Trail, Schoodic Head Trail, and Anvil Trail makes for a nice 2.5-mile loop through diverse forest scenery. A rock outcropping known as "the anvil" is also an interesting landmark and mini viewpoint. The lesser-hiked Schoodic Head East Trail is a steeper and more direct route to the summit. A loop hike up to Schoodic Head is best started at the small Blueberry Hill parking area, located roughly half a mile past the loop road's junction with Schoodic Point Road. Blueberry Hill offers easy access to sublime coastal scenery with views of Little Moose Island just to the south and Schoodic Island Island further away to the southeast. (Should the Blueberry Hill parking area be full, a few smaller roadside parking areas can be found just down the road.) Across the road is the trailhead marker for the start of the Alder Trail, a trail that has been straight-cut through the thick brush; this is admittedly the least interesting part of the hike. After only .7 miles, the Alder Trail ends at a dirt road; walk straight along the road and within minutes you will hit the start of the Schoodic Head Trail on the right. Once on the Schoodic Head Trail, the scenery gets more interesting as the trail starts heading uphill through the beautiful thick forest under Schoodic Head. Cute little blue metal birds on the trees blaze the way, a marker style unique to just this trail. 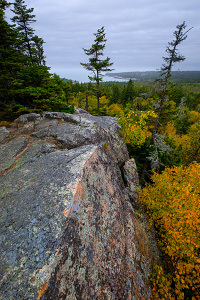 Once the trail ascends above the forest, you will be hiking on more solid slabs of granite along the Schoodic Head ridgeline. Continue north (past the junction with the Anvil Trail, the East Trail, and the trail to the parking area at the end of the dirt road) to a nice little viewpoint that looks to the east. While you could return the way you came, taking the alternate Anvil Trail back down is a more interesting option. The Anvil Trail descends from Schoodic Head through an interesting break in the rock formations and then heads back south through the forest. The highlight of this trail is a large outcropping of granite known as "the anvil" -- the trail wanders up and over the interesting rock formations and a short side trail leads to a nice little viewpoint. Soon enough, the Anvil Trail reaches the road and it's a short walk back to Blueberry Hill. 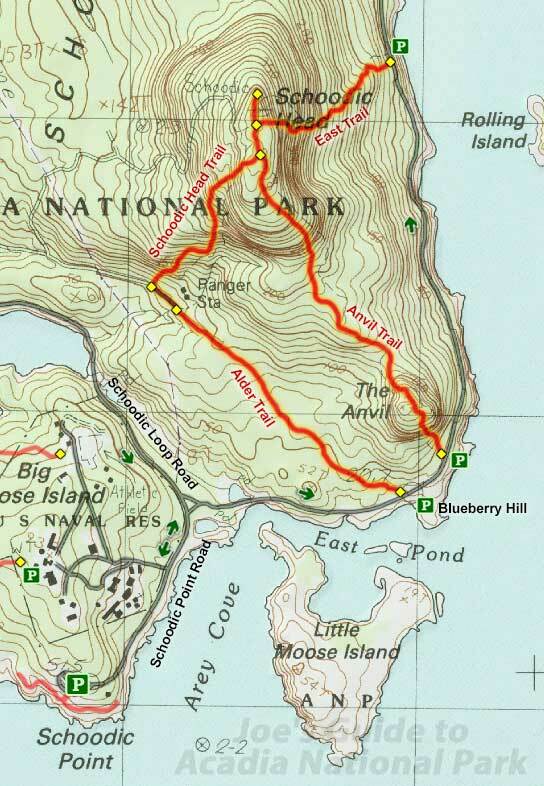 Schoodic Head East Trail: An alternate route to the top of Schoodic Head is the East Trail that starts 1.2 miles down the road from Blueberry Hill. With similar scenery to the Anvil Trail, this trail is shorter and steeper and attacks the east face of Schoodic Head more directly by zigzagging up a steep hill. Near the top where soil gives way to bare granite, the East Trail joins up with the other trails and you can continue to the Schoodic Head viewpoint. The East Trail is roughly .8 miles (in and out) and may take roughly an hour for the round trip. Schoodic Head is admittedly less interesting than the various peaks located on Mount Desert Island. But if you have already visited the oceanside highlights of the Schoodic Peninsula, this is a good hike that traverses some very pleasant inland scenery.